We started our organization in 1994 as an Painting Contractor and ever since we are engaged in offering a wide range of services such as Interior Painting, Exterior Painting, Decorative Painting, Texture Painting services, for Residential / Apartments, Villas, Office, Commercial space, Hospitals, college, and schools etc. Owing to the efforts of our dedicated team of professionals, we have been constantly engaged in offering the best quality Exterior Wall Printing Service. We provide our clients a best Exterior Wall Textured Painting Service to meet the diverse requirements of patrons. Professionals render these services very precisely as per the likings of our clients. These services are extremely notorious and deliver supreme level of satisfactions to the clients. Exterior emulsion paint of ISI make. By keeping in notice the assorted desires of our clients, we are immersed in rendering Exterior Painting Services. Rendered under the command of trained executives, these offered services are highly in demand. Additionally, these could be altered as per the changing desires of our clients to attain their trust and credibility. We are doing complete waterproofing with chemical coatings of terraces, basements, podiums, sunken toilet, bathroom areas with APP membrane, EPDM membrane, Box Type waterproofing. We do a repair of RCC members with polymer mortar, epoxy mortar. 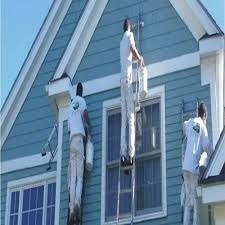 We do external and internal painting works. We also do Civil works.